Newcastle centre Rob Vickerman has signed a full-time deal with the England Sevens squad from next season. 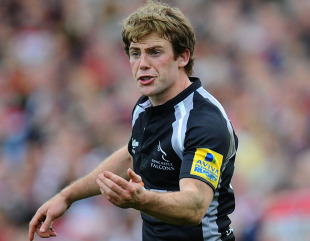 Vickerman's two-year agreement will see him leave Kingston Park and join up with the Sevens panel, coached by Ben Ryan. England have included eight full-time Sevens players in their squad for various IRB Sevens World Series events this term, with Ryan's side second on the overall standings. Vickerman, 25, made his Sevens debut in 2005 and was part of the team that won London and Wellington titles four years later. "The opportunity to be a full-time sevens player fills me with excitement, and it means I can fully commit to the world series and spend all year developing my skills and fitness purely for Sevens," he said. "I have thoroughly enjoyed playing for Leeds and Newcastle, and I am proud about making 50 Premiership appearances, but the chance to focus on playing in a top England Sevens team is too good to miss. "I back Sevens to develop into a truly global game, and inclusion in the Olympics from 2016 will see the sport rocket. I want to be part of that and part of a consistently-successful England team driving the standards." Ryan added: "Rob was my England sevens player of the season in 2009 and provided the glue that allowed everyone else to operate. His game-sense, professionalism, skills and work ethic make him the perfect first signing for next year's squad."